Do you like popcorn or does your Valentine? Then I have the perfect gift idea for YOU this Valentine's Day! Chippy’s Kettle Corn, LLC founded in 2002 by culinary experts, Scott and Linda Chipman, have been crafting fresh gourmet kettle and popcorn using only the freshest, local ingredients from around the Midwest. Their newest venture, Chippy’s Popcorn Creations delivers a truly fresh, homemade gourmet popcorn experience with 30 plus flavors, specialty blends and seasonal inspirations. Chippy’s gourmet popcorn is the perfect taste for every occasion, every holiday and every day. This Valetine's Day, let Chippy's Popcorn Creations help you POP that age old question ‘Will you be my Valentine?’ with all new Chippy’s POP-pops. A twist on traditional cake pops of dense, moist cake on a stick— is re-created using gourmet popcorn. POP-pops are made in a variety of flavors featuring a delectable inside of popcorn, cake and frosting then coated and decorated with complimentary flavored chocolates and decoration. Perfect for the one you love. 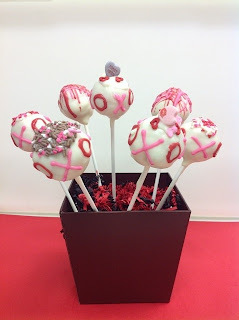 I love cake pops so I knew these had to be good since I also like popcorn! And I was right! They were moist and had all my favorites inside: cake, frosting and popcorn! It is such a unique and fun gift idea for the popcorn lover in your life! This Valentine’s Day, spoil your sweetheart in a new, fun and flavorful way. 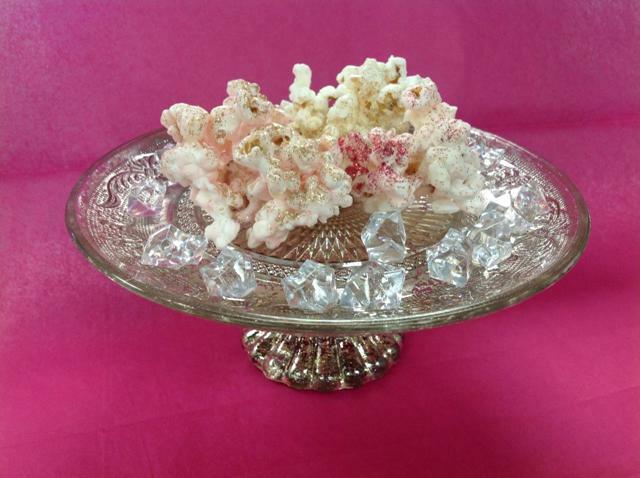 Go beyond traditional romantic foods and surprise the one you admire with new POP-a-razzi, a pink and white champagne popcorn dusted with glitter. Chippy's also features lovely flavors of Tuxedo Champagne and Strawberry, Raspberry, Champagne and Chocolate for the holiday. 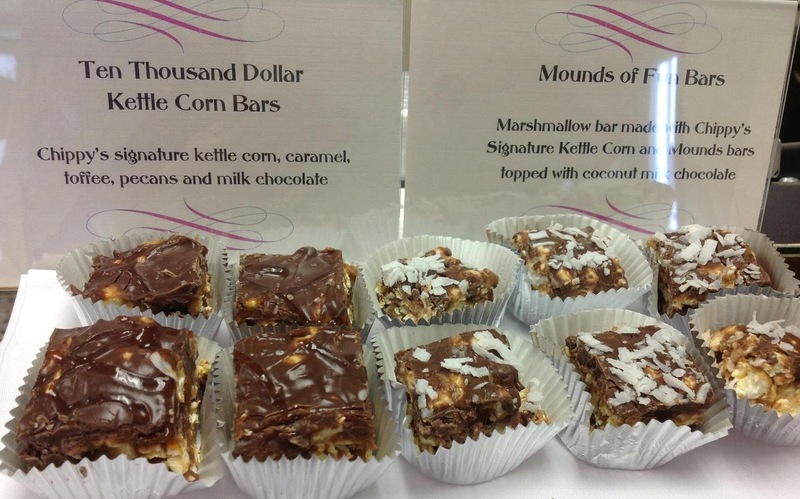 From unique flavors to gourmet treats, Chippy's also introduces Ten Thousand Dollar Kettle Corn Bars and Mounds of Fun Bars. Taking popcorn to the next level, the Ten Thousand Dollar Kettle Corn Bars are made up of Chippy’s signature kettle corn, caramel, toffee, pecans and milk chocolate.My favorite item from Chippy's Popcorn Creatinos are the Ten Thousand Dollar Kettle Corn Bars! They were so rich and chocolately! Whether you’re seeking tastefully fresh gourmet popcorn for entertaining, snacking or gift-giving, you will be delighted by the sweet and savory tastes offered by Chippy’s Popcorn Creations. Chippy’s can customize the flavor, color, size and packaging for a one-of-kind, gourmet flavored popcorn experience. Buy It: You can purchase all treats from Chippy's Poporn Creations by visiting www.chippyspopcorncreations.com or by calling 920.885.CORN (2676). Popcorn is my all-time favorite. I grew up eating this with my siblings during snack time or while watching cartoons.